Emberheart had gently nudged her mate upon waking with a request to meet her by the camp entrance with Ravenpaw, realizing that in her recent withdrawal from a lot of things she had included Dawnpetal, and failed to bond with the kit her mate had adopted in the process. She felt awful, but wallowing in self-pity had proven completely and utterly fruitless, so she was determined to make it up to her family instead. The first step in doing so was a patrol, just the three of them spending time together. Making up for all the lost time. -Good morning!- she meowed happily. "Hello, little Ravenpaw," Dawnpetal purred lovingly, giving her adopted daughter a quick affectionate lick between her ears. "Are you ready to go patrolling with your two mothers?" Though she knew it was true, being referred to as one of Ravenpaw's parents felt odd to Emberheart - but that was why she was doing this, wasn't it? To make it not feel strange anymore. This was her family, as much as she had let herself neglect them for a time. That was in the past, and this was now. 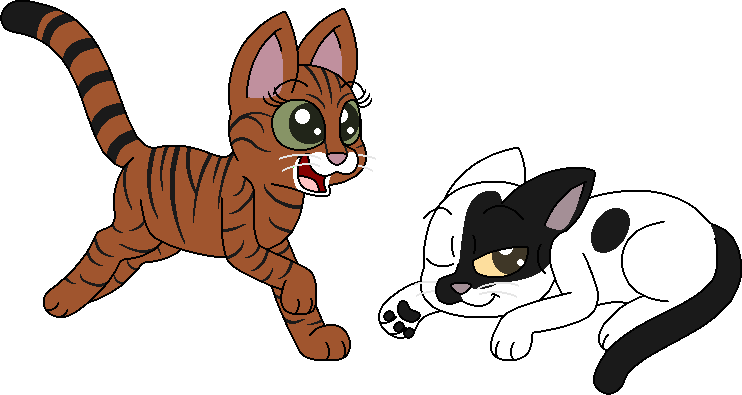 "We're going to bring back the most prey that ThunderClan has ever seen," she offered playfully. "Maybe we'll even come across an owl again." Sour as her opinion of the bird was, looking back on her encounters with them brought memories of a happier time with it - particularly when she and Dawnpetal, still apprentices, had technically snuck out of camp to go hunting. "Oh, is it a race you want?" Emberheart purred, her tone teasing. "Ready, and... Go!" With a mrrow of laughter, she took off, racing up the ravine, and stopping only once she reached the top, looking to see if the other members of her family had beat her to it. ”Hey, we weren’t ready!” Dawnpetal called, voice cracking with laughter. She bolted after her mate, racing up the ravine with long, confident strides, just barely managing to reach the top when Emberheart did. "A tie," Emberheart laughed, nuzzling her mate momentarily. "A new competition, then. Who can catch something first! The winner gets first pick when we get back," she declared cheerfully, happy to be falling back into feeling like herself. Something about making little things into a game never failed to make it seem more exciting. "Whenever you're ready." Ravenpaw smiled "I can do that! wait here!" she then started to look around, searching for a prey, until she spots a mouse. She crouched, starting to stalk the small creature, staying completely still when the rodent looked in her direction, and when she got close enough, she pounced. The small creature squeaked before going completely silent, Ravenpaw did a quick kill, she gave her thanks to Starclan and finally went over her mothers and dropped her catch at their paws, purring loudly. "We have a winner, clearly," Emberheart purred proudly. "Are you sure you've mastered them, Dawnpetal? I seem to remember a certain apprentice..." she teased, recalling their adventures as apprentices and how her mate had struggled with the techniques at the time. The time they fought off an owl together stuck out in her mind. She paused, looking around to make sure they weren't especially close to the Owl Tree. Catching an owl twice was more than enough, thank you very much, even if she was more than a match for one by herself now. Still, there was a part of her that wished they could go back in time, and be apprentices racing back to camp once again. But a glance at Ravenpaw brought a smile to her face again, and she remembered that not every change was for the worse.